Below are more comments and feedback I received from readers who bought the Destination Kimberley e-book. All other comments are unsolicited, spontaneous feedback from readers that I received via email or that were posted somewhere on my site or on the web. You can also find reader feedback about my second guide e-book Destination Top End at the bottom of the page. These days, most people actually purchase both guides. 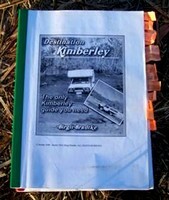 Many of the Destination Kimberley testimonials also refer to both books. But the Kimberley is what sticks in people's memory. The NT just does not compare. "I have read this guide and I can hand on heart tell you it is THE ONLY GUIDE TO THE KIMBERLEY YOU'LL EVER NEED (as it states on the cover! But it's true.) It has everything right down to tyre pressure you'll need and the places to eat. Anyone who knows me knows I have no vested interest in this post other than to advise my fellow traveller. This is the most enjoyable travel guide I've ever read." "The best Kimberley General Information website I have found to date is www.kimberleyaustralia.com. If you've ever thought about visiting the region, whether on one of our tours or on your own, this is well worth a browse. The website is only part of the story. From the website, you can pay for and download a book which has even more information. I've got a copy (my edition is 194 pages) and am happily working my way through it. Although I've been going to the Kimberley for the past 30 years, I've still found new information. Highly recommended." Just a note to thank you for our marvellous trip and to say how sorry we were to miss seeing you to thank you in person. Four of us travelled from Port Lincoln to the Kimberley region for 7 weeks in the one vehicle last July/August. Our friends slept in their camper trailer, my husband and I in a tent. We printed off all your pages and armed with them we spent a full weekend in the one home planning our itinerary going through page by page - your guide as our Bible. We followed your advice to the letter and were so thrilled by the outcome! We called in 3 times to thank you personally, but alas for us but hurrah for you - you were away travelling o'seas as the lady staying in the studio/cottage told us on our final attempt. So we took a photo of your dear dog instead, and the glorious sunset on the rocks nearby your corner. Everywhere we go we tell everyone how your guide helped make our dream of a life time come true. We hiked all the gorges, my husband estimated we walked 40-50 kms. We were thrilled by the Tanami, Wolfe Creek Crater, Bungle Bungles, Broome, Cape Leveque, Horizontal Falls, Mornington Wilderness Camp, Drysdale River Station, Mitchell Falls, Home Valley, El Questro, Kununurra and surrounds etc. Drove 10,800 kms and are still friends. Not bad for 64 - 69 year olds, eh? People still marvel at the fact that we did all that in the one vehicle. Guess we are just amazing people!!!! Just joking... We were well prepared - all had our roles and your book helped us avoid many of the stresses of unfulfilled expectations that cause stress. Plus our friends are just that... brilliant at friendship! Not a flat tyre or breakdown either! Thank you and bless you. Our trip would have been nowhere near as brilliant and easy without your guide, your intimate knowledge and hard work. Thank you sooooo much! We just FELL IN LOVE with our nation - its beauty and its people. We hiked, canoed, swam and went on all the cruises... and never tired of the changing scenery... BLISS! Thank you dear lady, you are a national treasure! "Thanks Birgit for putting together Destination Kimberley, we constantly referred to it while on our trip and would have missed many awesome places if we hadn't had it with us." We've proved you're never too old if you do your homework first i.e. read what Birgit has to say!" "We have just spent 6 weeks up in the Kimberleys and thanks to your great book stayed at some wonderful places. The best spot we thought was Bully's Camp. This was the sort of camping we were looking for. Jeff was a great host and we spent a lot of time with him. We ended up staying there for a week, it was magical. I absolutely love the Kimberleys and would throw it all away down here to live up there. Something we are considering. Kununurra was another magical place. I can understand why you fell in love with it. Thank you very much for your insight on the Kimberleys. We found it all as you have written. We hope to get up there again next year, so will keep in touch." "Hi Birgit, we have just returned from our 8 week Kimberley trip yesterday. Our trip has been planned for 12 months and your book was magnificent in knowing where to go, what was there, how long to stay etc. We met quite a few people on the road and showed them your book, all were very impressed, one family borrowed it and read it all night. There wasn't a day in our whole trip that your book wasn't open. This is a MUST book for anyone considering doing the Kimberley. "As a family of 5 it was a trip of lifetime and we could go back up there tomorrow and do it all again. The Dampier Peninsula was one of many highlights of our trip and is a must to see and do. We could of not seen and done as much as we did without the comprehensive Kimberley Travel Guide by Birgit. Thanks again B.
I could write on forever about what we saw and did in the Kimberley area, photos don't do the Kimberley justice, you have to see it yourself." Close window to return to order page. "Last June I travelled from Broome to Kununurra, including a visits to Purnululu and the glorious Mornington Wilderness Camp, with my partner in a Subaru Forrester over about two and a half weeks and had a superb holiday. Your notes on the journey were absolutely brilliant - I printed up the "nitty-gritty" section for easy reference while we were driving and I still treasure the dog-eared red-dust stained sheets. As we are keen walkers, your detailed information re walks into the gorges was particularly appreciated. I even took note of whether the walks were sunny or shaded and took an umbrella for shade as required, a wonderful tip picked up from my Philipino friends while travelling with them in their beautiful but hot and sunny country. "I purchased your Kimberley guide earlier this year. I must say I did think twice about getting it as I have travelled the Kimberley in my Troopie four times previously. I was wrong, I found your guide fantastic and so much help to find the beautiful spots you mention. The guide (printed out a copy) sat between the two seats and was used continually. The Mitchell Falls were simply breath taking. Thanks for all your hard work in putting the guide together, great job and I certainly showed it and spoke glowingly to all and sundry. I was tempted to chase you up when we were in your beautiful Kununurra. Then we thought you must get plagued by heaps like me and chose to let you have your well deserved peace. I hope you have a peaceful festive season and hope some day to meet you and have a cuppa or beer." "A household name for any Gibb driver, the Lonely Planet for instance only dedicates half a page to the Gibb! ... Thanks so much for your help"
"Thankyou for your great Kimberley Travel Guide, your passion for the area shines through. We used several of your suggestions, including the campsite at the Durack River Crossing and Sawpit Gorge off Duncan's road during our eight weeks travelling and camping throughout the Kimberley and Dampier Peninsula. I must say, we used three guides, that published by the Derby Visitors Centre on the Gibb River Road, the Ron and Viv Moon Kimberley Guide and yours - your guide was the one most consulted." "I would like to thank you for all of your assistance in organising this trip. Without your great book the job would have been much more difficult. I had a printout of your book in the car with me and when we had to change routes several times it made the planning for the change so much easier. All the info I required was there including where to camp etc. I can and will recommend this book to anyone planning a trip to the Kimberleys anytime in the future." "Thank you and congratulations on a fantastic guide. We just returned from a 6 week, 12,500km trip across the Gibb to Mitchell Falls, Derby, Bully's and back across the Northern Highway. What a character Jeff is... we spent four days and our three little ones, 10, 8 and 5 yrs, loved every moment. They made spears and went mudbcrabbing, fishing and exploring the mangroves and beaches. What a magical place is the Dampier Peninsula. We stayed at Middle Lagoon and Bully's and visited Whalesong Cafe, One Arm and Cape Leveque. There would be so much more to the Kimberleys that we haven't seen but we'll back. Thank you!" "Thank you so much for this great guide. We are 67 and 64 years old and had a lot of doubt about driving the Gibb River Road. We have experiences with 4WD driving, as well at home as in Australia. But still. Your book gave us exactly the answers that we were looking for." "Dear Birgit. I just want to let you know how useful your guide is! We've just returned from three wonderful weeks in the Kimberley, and we just loved it all! Your guide was our 'bible' - so useful for accommodation and what to see and do. We'll be returning to look at your website regularly in the future to re-live what we've done." "You were instrumental in making us choose a campervan for going Broome-Darwin via GRR. It was a fantastic trip, and your Kimberley guide which I'd bought previously was extremely useful. Clear, extremely detailed, and with a nice sense of humour. Suggestion: why don't you extend your guides to NT and Pilbara? Best wishes and thanks, Stefano & Makara"
"Your guide was fantastic - both the map and the guide book. I am so glad I told my wife not to walk in front of the the car as we crossed the Pentecost River! She was scared (so was I) at going through the river without knowing the depth. We saw a 15' salty the next day in the river! Best experience was the walk to the Manning Gorge - what an experience! Thanks so much." "Just a quick note to thank you for your guide. We have just finished a three week trip through the Kimberley (Gibb River Rd, Mitchell Falls, Kalumburu and Purnululu) in a hired 4WD camper. Thanks to the information and advice in your guide we had a fantastic trip and great experiences with no mechanical or other issues. Thanks again for a most comprehensive, accurate and well written guide." "A Big Thank You! My wife and I have just returned from a 6 week trip which included 3 weeks in the Kimberley. One of the final deciding points on whether to make the trip to the Kimberley was the travel guide information provided by you. We had a great time travelling from Broome to Kununurra including Cape Leveque, a sea plane flight to the Horizontal Falls, the Gibb River Road, Windjana, Manning Gorge, Mitchell Falls, ElQuestro and much more. Your travel guide was an excellent and up to date travel reference. Keep up the good work. We'll be back some time in the future." "Hi B! Finally back home in the reality again after a fantastic holiday in the Kimberley! Even though, due to the rain and some unforeseen occurences, we didn't manage to get everywhere we wanted to (Mitchell Falls, Mornington WC...) this holiday was singular and unforgettable. It was topped-off by 4 days at the Broome Cable Beach Club, where I celebrated my 50th birthday. Dear B: your "Destination Kimberley Guide" was during this 4 weeks (and during lead time) always our loyal companion and a big, big support. Thanks a lot!" "Birgit, just a quick note to say how much we appreciated having your guide with us over the last 4 weeks. My wife and I hired a 4wd camper from Broome and spent a fantastic time through the GRR, Mitchell Plateau, Bungles etc etc. Your guide gave us all the practical information we could ask for. If we were ever in doubt we referred back to your work, excellent and without peer. Keep up the good work. Thanks once again for your valuable contribution to making our visit a memorable one. Best wishes John & Shelagh Wagers"
"Dear B. Your Destination Kimberly is fantastic. Three friends and I have been wrestling with just the questions that your publication sets out and answers so clearly. We were delighted to discover your book. Well done! You have saved us a lot of time and angst." "Quick note to thank you for the Guide. We used it as our bible for the 2 months we were up your way and found it very useful. Thank you particularly for the RAAF Boab Quarry site - we had it all to ourselves (apart from 2 nice bulls and a not so nice king brown snake!) and camped at the head of the 'lake'. We are looking forward to getting back into God's country again soon." "Somehow during our trip along the Gibb River Road/Kununurra I sort of hoped to see you along the road to say thank you for the book - I almost felt that we knew you - because we read you book "to pieces" - :-)"
"We just wanted to say thank you so much for your guide. We travelled through the Kimberley this summer, from Darwin to Broome (by way of Birdwood Downs and Cape Leveque) and found your guide invaluable. My two boys are on first name terms with you - always asking 'What does Birgit say' about any particular place! Keep up the good work!" "Destination Kimberley is a great resource for mug campers like us. We purchased the e-book last December. Barbara and I are spending 3 weeks from May 11th doing Broome, Cape Leveque, GRR, Kunanurra, Bungles and back to Broome in a Britz 4WD camper. Your advice has been invaluable. Thank you." ...Thanks for putting together your guide." "I really loved the guide and it was very helpful for our trip, we went to a lot of places you recommended and benefitted from the "inside information"." "I have yet to read all of your e-book, but am already really impressed, this is good stuff & really quite refreshing. Well done & thanks again." "I have purchased a copy (and printed a copy) of your 'Destination Kimberley' and have to admit I can not keep away from it. It is a great source of information. Thanks for that!" "Hi B, my husband and I have just returned from our 4 week journey from Darwin to Broome in a hired 4WD Camper. Thanks to your wonderful guide we had a very enjoyable, informed and safe trip. What an amazing country we have! I think the highlight of our trip was the 7 days we spent at Cape Leveque and Middle Lagoon. We (as you suggested in your guide) booked the beach shelters in both and could not believe how lucky we were to have such magic camping spots!! Middle Lagoon we nearly had to ourselves, being the only ones camping on the beach. I could go on for ages with everything we saw and did but you have heard it all before. So just wanted to thank you again for your guide and I have passed your site address onto friends thinking of doing the same trip. Thanks again B and good luck with your future ventures and website. Regards, Sheena"
"Hi Birgit, Just wanted to give you a huge thanks for all your hard work in the guide. My husband and I have returned after a short fortnight travelling from Darwin to Broome. Your guide is absolutely essential and the only guide necessary (along with HEMA map!). We were virgin 4X4 drivers but we didn't come across anything too tricky apart from getting off the beach at Middle Lagoon after a particularly blowy night in one of their beach shelters. My best memories are the 6 am walk to the Mitchell Falls to escape the 'crowds' and the sun, the reef walk at Gumbanun, the obligatory helicoptor over the Bungles, Staircase to the Moon in Broome. We crammed a lot into 14 days. We could never have done so much without your invaluable guidance. A top top guide book!" "Having driven from Brisbane to Kununurra and approaching the border of WA we reached for our copy of Destination Kimberley to refresh our memories with regard to matters of quarantine and realised we had left it behind. We had to face the area with only what we remembered and the brief notes we had made. We felt like orphans. We comforted each other with the thought that our preparations, our schedule, our booking of accommodation had already drawn on the information we had found in the book. It was not enough. We felt our loss deeply. I sent you an email and was greatly relieved when you made a link to the book again available to me on the net, so that within 24 hours we were in possession of a printed copy of your book again. We found it very helpful and never once were we led astray. Thanks for your help. Our seventeen days' travel were delightful. What a place!! I believe that the best preparation for travel in this region is to have already done it. Failing that, have a copy of Destination Kimberley by B. Bradtke on hand." "Vielen Dank erst mal für den Newsletter und vor allem das E-Book. Hat mir bei meiner - leider doch sehr bruchstückhaften - Planung sehr geholfen. Danke für Deinen tollen informativen Service!" "Have been in your beautiful Kununurra since Sunday (staying @ Hidden Valley as you recommended). Visited Wolfe Creek crater and spent a night under a full moon then onto H/C and we camped out at Sawpit Gorge for 3 nights...just magical. Had 3 nights in the Bungles and followed your advice re the walks. We thought Tassie had some beautiful scenery, but the B/B were just awesome! Thankyou for your very informative info, so far it has been our 'guiding light'." "A couple of nights at El Questro were good fortune for us as a couple we met who were returning to Qld after 3 months holiday gave us ther well used copy of 'Destination Kimberley'. We wished we had had it at the start of our journey." "Birgit, your website and the Kimberley guide we purchased from you is great!" " I have downloaded your book on the Kimberley proper, and I am very impressed with the work you have done to produce and maintain it. At first, I had no interest in driving from Darwin, and ignored your advice to buy the NT companion book, but now my wife and I have decided we should concentrate our stay in the Eastern Kimberley, and driving from Darwin would make great sense. I wonder how I might get the second book. Thank you so much for your books, and your undeniable expertise." "I had a chance to look through this last night and it is very impressive  thank you for all your hard work that we will now very much benefit from during our travels in July." "Your Kimberley guide is fantastic. It is very thorough and one of the best sources of information that I have found. Your guide will be one of the first things that gets packed into the 4WD. Well done. Thanks." "Have just bought, downloaded and printed your book so all ready to go! Thanks for all your help  I can't tell you how helpful it is :-)." "My husband and I have used your guide for our trip in July 2008. A work colleague is going in a few months so I'm passing pass on your website to him. Thank you for your fabulous commentary - I don't know what we would have done without it!" "Thank you for sharing your experience and expertise with the world! Your Destination Kimberley is a delight to read and makes our planning almost as joyful as I am sure our trip shall be." "Wow!! What a monumental task you undertook, and to do it so well, too. First up, it is great, so good in fact that I don't need to visit those places anymore, your book told me everything I ever wanted to know. (Just joking of course.) Yep, I love the book. Keep up the good work." "Congratulations on your publication, it is excellent. Thanks very much." "Your Guide (which I bought) is very good. Very good, systematic, congratulations. (Normal, German roots.)" "Dear Birgit, we are back from Downunder! We travelled from Darwin via Gibb River Road to Broome the last 5 weeks. In our luggage was your travelbook, we felt comfortable and safety with your informations. Your travel guide is fantastic, we saw many interestings places. "...your guide is truly excellent...congratulations!" "Thanks for "Destination Kimberley", a great publication and so far very helpful in planning our 14-day trip in May/June 2009." "Received the book download and have now downloaded and printed off a copy with no problems. Thank you! I am most impressed with the detail and presentation of material. Congratulations on such a fine guide!" "I just read your latest update. Another informative piece, keep them coming! I look forward to reading them just to get the "jump/low down" on other tourists who have unfortunately not bothered or come across your guide." "Destination Kimberley is more than a guide - it's an inspiration! Written in an extremely friendly and engaging style, the author drew me in and convinced me that the Kimberley was an exciting, accessible and adventuresome destination - even though I'm a solo woman traveler. I particularly liked the detail in Destination Kimberley. Each time a question came to mind, an answer appeared. With this book in hand, I don't need to look at any other source of information - it's all there - anything I could possibly need to plan ahead for this trip!" Travel writer, journalist, editor of this Backpacking Women Travel site. "Yours would most definitely be the only guide an international visitor needed to plan their top end trip  and it's such a great guide to a big part of our land and our lifestyle that even if they are not going to the Kimberley they should read it anyway!" "Hi B! We are back from our trip, just want to thank you for the book again, it was what we ran by. Everything in the book was spot on to the km. It was also great reading as well. We all had a fantastic time can't wait to go back again to see what we didn't get to see this time due to the lack of time. We were well prepared & didn't rush like your book recommends. It also had more accurate imformation than any other book we took. THANKYOU VERY MUCH. Regards Sean, Gayna & kids." "Birgit, I have your excellent 'Destination Kimberley' (I wish I'd known about it years ago ... I can now throw away all the printouts from tens of websites I have been using to research our trip!!!) I would not have known about the Duncan Road but for you. Your book is everything I could want ... brilliant! Thanks." "Thank you!! Great resource. Originally I was just going to get a staionwagon and jayco, but once I discovered your guide, and started reading, we decided to spend a bit more and equip ourselves so we could really get to some special places. My wife has taken a lot of reassurance from your basic message, which I read as "take your time, don't push it, be sensible and do some planning". Thanks again for putting together such a great resource." "I very much enjoyed reading your book! I am absolutely enthralled by it. It is obviously written by a local with a passion for their stomping ground. I am very satisfied. The information you provide is more than sufficient  which is why it is such an interesting read. You give enough details to educate but you never bore." Canoe trip down Ord with bush camps terrific. Mambi island boatramp camp terrific. Nearly expired doing Piccaninny walk late August due to heat. Well, after travelling for nine weeks along the Gibb River Road, the Tanami, Cape Leveque and following your bible to the last letter of all towns and places of interest we had a fantastic adventure. Of an evening we would discuss the next days plans and travel based on your information. Without this I think we would have only seen a small part of the Kimberly region on what time we had. It was like having guide on the trip. Thank you for providing us with such an honest publication." Just wanted to let you know I am just this hour back from our Kimberley trip  your Guide was fantastic! We loved Tumblegoodiron and Pushups the most! All alone  what beautiful, beautiful spots! THANK YOU! The first night at Pushups my husband said, 'Well, Birgit's book has already paid for itself'!!" "We wish to thank you for the push in the back you gave us to do the Gibb River Road. We are both early 60, had never done any 4x4 nor any camping, now we did it and we loved it ... The secret is to follow your advice..."
I just wanted to say a massive thanks for your amazingly accurate, realistic and general bible of a guidebook for the Kimberleys that I downloaded from your website. It really helped make our holiday. We had the most fantastic time and couldn't believe what a beautiful part of the world we were in. Your directions, recommendations and descriptions of the less visited gorges and sights were really valuable and we often had the places to ourselves. It was all in all a magical trip and one that will stay with us for a long time! 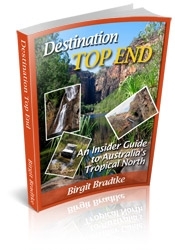 New: I have released a second guide e-book, Destination Top End. Recent feedback often refers to both books (most people buy both guides). "Just have to let you know that we are just home after doing Kakadu and the Kimberley in just over two weeks and your two books went with us EVERYWHERE - from the Old Jim Jim Road to Broome, we carried the relevant parts under our arms even when we went walking! We have to tell you they were absolutely marvellous! Up to date and accurate, they added so much to our trip and enabled us to see very specific things we wanted to and not waste any time as we had so little of it. We have been singing your praises to others who want to do the trip! "We extensively used your guides during our two week Darwin to Broome tour and also during our visits to the Red Centre. Your advice never failed us. I constantly referred to Birgit's suggestions when advising my partner as to our next destination - he was the driver, I was the navigator. I can't say enough good things about your very reasonably priced guidebooks." "We purchased both of your e-books and are studying them carefully. My husband is busy making an itinerary... he likes that structure! THANKS for having so many great resources for your area. Our trip has shifted from something that would be just enjoyable to a great adventure." "Love your site (so much I just bought the Destination Top End e-book). You completely changed my plans for this area (visiting in late July/early August) - we are now renting a 4WD, doing independent camping, and have extended the time in the area. We are looking forward to seeing some places we would otherwise have missed." "Dear B, we just returned from out trip to the Top End and Kimberley. I will write more later on and send you a few pictures, but I wanted to say your guides were great. I organized the whole trip based on them and took them with us. They were reliable and full of interesting info. We loved our trip and were sad when returning home." I am sending a picture that you can share if you like, but mainly for you. It is your guides at the end of our trip. They are dirty with reddish dust, with all the notes I had made to find things faster, bent, definitely VERY USED. Thank you once more for all the the details and reliability of the info given." "B, You have done it again. Your latest guide Destination Top End is fantastic! Maps, little known places, directions, points of interest and common sense advice all written in plain language. It is a must for anyone travelling from Darwin to Kakadu and beyond. Judy and I have already packed it for our trip in July 2010. Close window to return to Destination Kimberley order page. Find out more about Destination Top End and save over 25% when buying both guides together. This site uses Australian English, as that is what Australians use.